Korčula, an island on the boundary of central and south Dalmatia, is renowned for the beauty of its nature and rich cultural heritage. Suffice it to mention the islet of Proizd, elected in 2007 as the most beautiful beach in the Adriatic, or the town of Korčula – one of the most beautiful medieval towns in Croatia. A mild climate and plenty of sunny days on a yearly basis are particularly beneficial to the vineyards of Korčula where the highly reputed white wines Grk and Pošip come from. Korčula offers numerous possibilities for accommodation: apartments, holiday homes, hotels and camps, and the island coves are sailors’ favorite stopover. Visitors can indulge in Korčula’s specialties served in the island’s restaurants, taverns and agritourism. Those more active will have hiking and cycle paths at their disposal, as well as diving centres and sport facilities. 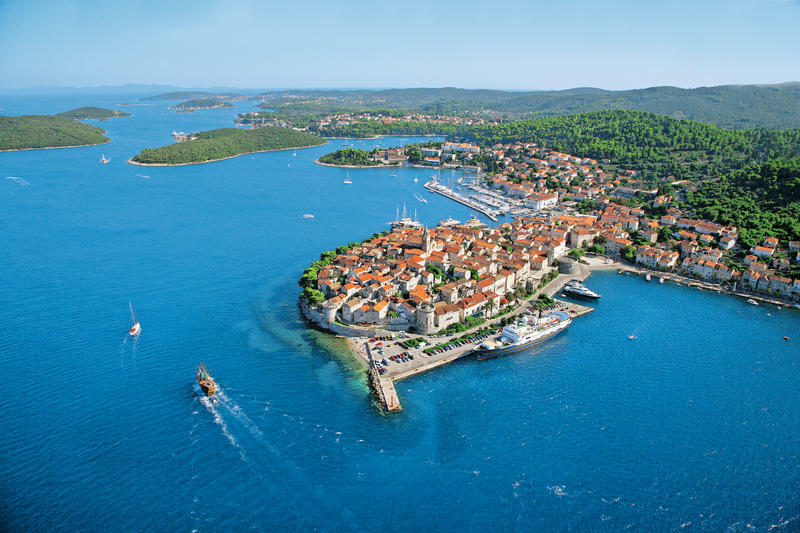 Korčula is the sixth largest Adriatic island, 46.8 km long, and its 16,183 inhabitants make it the second most populated Croatian island, immediately after Krk. Regular ferry lines – from Orebić on Pelješac penisula to Dominči (ferry quay not far from Korčula town), from Split to Vela Luka and from Drvenik to Korčula (only in summer) connect the island with the mainland. Fast catamaran lines connect the town of Korčula with Split and Dubrovnik, and Vela Luka with Split. The largest Croatian ferry company, Jadrolinija, runs coastal ferry lines connecting the town of Korčula with Rijeka, Split and Dubrovnik, and in the summertime with Bari as well. There are also regular bus lines linking the island with Dubrovnik, Sarajevo and Zagreb, while local bus lines operate on the island. Korčula was inhabited back in prehistoric times, as witnessed by the archeological finds from Vela Spila (literarly Big Cave) near the town of Vela Luka. The next emigration wave brought the Illyrians who left numerous hill-forts (citadels). In the 6th century B.C. Greek colonists established a settlement on the island naming it Korkyra Melaina (Μέλαινα Κόρκυρα) i.e. Black Korčula for its dense pine forests. The Lumbarda Psephisma, named after the place where it was found, is a stone tablet engraved with the names of the Greek colonists and it represents the oldest written document on the territory of Croatia. Later on, the island became part of the Roman province, only to be settled by the Slavs in the 6th and 7th century. The island kept changing its rulers throughout the Middle Ages, with its autonomy declared in 1214 when the Statute of the town and the island of Korčula was passed. Shortly after, Korčula became part of the Venetian Republic and subsequently of the Habsburg Monarchy, until the end of World War I.
Marco Polo, the world’s most renowned traveller, is reputed to have been born in Korčula town in 1254, and his supposed house of birth is located in the proximity of the Cathedral. What we know for sure is that he took part in the naval battle of Korčula between the Venetian (the then ruler of Korčula) and Genoese states. Having been captured, he described his travels to China in a Genoese prison.